An ancient Greek colony had once occupied the site of the city. Numerous monuments of antiquity confirm links between this territory and the Eastern Mediterranean. In the Middle Ages these lands were a part of the Kievan Rus, Galich and Volyn Principality, the Golden Horde, the Grand Duchy of Lithuania, the Crimean Khanate and the Ottoman Empire. Yedisan Tatars traded there in the 14th century. In the course of RussianTurkish wars these lands were captured by Russia at the end of the 18th century. From 18191858 Odessa was a free port (porto franco). During the Soviet period it was the most important port of trade in the U.S.S.R. and a Soviet naval base. On January 1, 2000 the Quarantine Pier of Odessa trade sea port was declared a free port and free economic zone for a term of 25 years. Odessa is a warm water port, but of limited military value. Turkey's control of the Dardanelles and Bosphorus has enabled NATO to control water traffic between Odessa and the Mediterranean Sea. 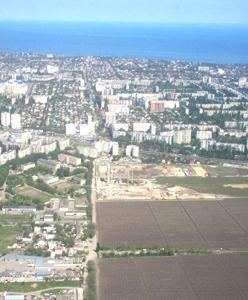 The city of Odessa hosts two important ports: Odessa itself and Yuzhny (also an internationally important oil terminal), situated in the city's suburbs. 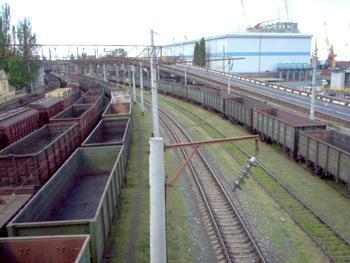 Another important port, Illichivs'k (or Ilyichyovsk), is located in the same oblast, to the south-west of Odessa. Together they represent a major transportation junction integrated with railways. Odessa's oil- and chemical-processing facilities are connected to Russia's and EU's respective networks by strategic pipelines. In the 19th century it was the fourth city of Imperial Russia, after Moscow, St. Petersburg, and Warsaw. Its historical architecture has a flavor more Mediterranean than Russian, having been heavily influenced by French and Italian styles. Odessa has always possessed a spirit of freedom and ironic humour, probably by virtue of its location and its willingness to accept and tolerate people of many different backgrounds. In the 15th century AD, nomadic tribes of the Nogays under the suzerainty of the Khanate of Crimea inhabited what is now the Odessa region. During the reign of Khan Haci I Giray, the Khanate was endangered by the Golden Horde and the Ottoman Turks and, in search of allies, the khan agreed to cede the area to the Grand Duchy of Lithuania. The site of present-day Odessa was then a town known as Khadjibey (also spelled as Khadjibei, Khadzhibei, or Gadzhibei; Lithuanian: Chadibejus; Crimean Tatar and Turkish: Hacibey) and was part of the Dykra region. However, the area was only sparsely populated with Turkic tribes and consisted mostly of unpopulated steppes. Khadjibey came under direct control of the Ottoman Empire after 1529 and was part of a region known as Yedisan and was administered in the Ottoman Silistra (Özi) Province. In the mid-18th century, the Ottomans rebuilt a fortress at Khadjibey, which was named Eni Dunia (Turkish: Yeni Dünya, literally "new world"). During the Russo-Turkish War of 17871792, on 25 September 1789, a detachment of Russian forces under Ivan Gudovich took Khadjibey and Yeni Dünya for the Russian Empire. One part of the troops was under command of a Spaniard in Russian service, Major General José de Ribas (known in Russia as Osip Mikhailovich Deribas) and the main street in Odessa today, Deribasovskaya street, is named after him. Russia formally gained possession of the area as a result of the Treaty of Jassy (Iasi) in 1792 and it became a part of the so-called Novorossiya ("New Russia"). A city was officially founded in 1794 as a Russian naval fortress on the ruins of Khadjibey and renamed Odessa by January 1795, when its new name was first mentioned in official correspondence. Neither the origin of the new name nor reasons for renaming are known, though etymologies and anecdotes abound. According to one of the stories, when someone suggested Odessos as a name for the new Russian port, Catherine II said that all names in the South of the Empire were already 'masculine,' and didn't want yet another one, so she decided to change it to more 'feminine' Odessa. This anecdote is highly dubious, because there were at least two cities (Eupatoria and Theodosia) whose names sound 'feminine' for a Russian; besides, the Czarina was not a native Russian speaker, and finally, all cities are feminine in Greek (as well as in Latin). Another legend derives the name 'Odessa' from the word-play: in French (which was then the language spoken at the Russian court), 'plenty of water' is assez d'eau; if said backwards, it sounds similar to that of the Greek colony's name (and water-related pun makes perfect sense, because Odessa, though situated next to the huge body of water, has limited fresh water supply). Anyhow, a link with the name of the ancient Greek colony persists, so there might be some truth in the oral tradition. The new city quickly became a major success. Its early growth owed much to the work of the Duc de Richelieu, who served as the city's governor between 18031814. Having fled the French Revolution, he had served in Catherine's army against the Turks. He is credited with designing the city and organising its amenities and infrastructure, and is considered one of the founding fathers of Odessa, together with another Frenchman, Count Louis Alexandre Andrault de Langeron, who succeeded him in office. Richelieu is commemorated by a bronze statue, unveiled in 1828 to a design by Ivan Martos. In 1819 the city was made a free port, a status it retained until 1859. It became home to an extremely diverse population of Russians, Ukrainians, Jews, Romanians, Greeks, Bulgarians, Albanians, Armenians, Italians, Frenchmen, Germans and traders representing many other European nationalities (hence numerous 'ethnic' names on the city's map, e.g., Frantsuszkiy (French) and Italianskiy (Italian) Boulevards, Grecheskaya (Greek), Evreyskaya (Jewish), Arnautskaya (Albanian) Streets). Its cosmopolitan nature was documented by the great Russian poet Alexander Pushkin, who lived in internal exile in Odessa between 18231824. In his letters he wrote that Odessa was a city where "you can smell Europe. French is spoken and there are European papers and magazines to read". Odessa's growth was interrupted by the Crimean War of 18531856, during which it was bombarded by British and French naval forces. It soon recovered and the growth in trade made Odessa Russia's largest grain-exporting port. In 1866 the city was linked by rail with Kiev and Kharkov as well as Iasi, Romania. The 142-metre-long Potemkin Stairs (constructed 18371841), made famous by Sergei Eisenstein in his movie The Battleship Potemkin (1925).In 1905 Odessa was the site of a workers' uprising supported by the crew of the Russian battleship Potemkin (also see Battleship Potemkin uprising) and Lenin's Iskra. Sergei Eisenstein's famous motion picture The Battleship Potemkin commemorated the uprising and included a scene where hundreds of Odessan citizens were murdered on the great stone staircase (now popularly known as the "Potemkin Steps"), in one of the most famous scenes in motion picture history. At the top of the steps, which lead down to the port, stands a statue of Richelieu. The actual massacre took place in streets nearby, not on the steps themselves, but the movie caused many to visit Odessa to see the site of the "slaughter". 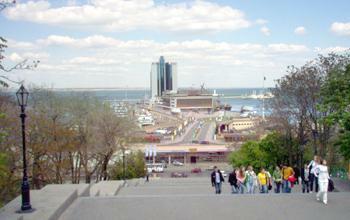 The "Odessa Steps" continue to be a tourist attraction in Odessa. 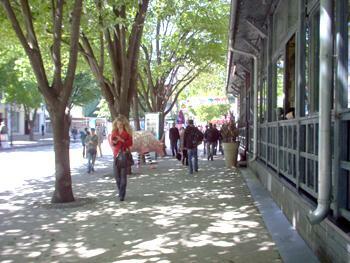 The film was made at Odessa's Cinema Factory, one of the oldest cinema studios in the former Soviet Union. Bolshevik forces enter Odessa. February, 1920.Following the Bolshevik Revolution in 1917 during World War I, Odessa was occupied by several groups, including the Ukrainian Tsentral'na Rada, the French Army, the Red Army and the White Army. Finally, in 1920, the Red Army took control of Odessa and united it with the Ukrainian SSR, which later became part of the USSR. The people of Odessa suffered from a famine that occurred in 19211922 as a result of the Civil war. During World War II Odessa was occupied by Romanian and German forces from 19411944. The city suffered severe damage and many casualties. Under the Axis occupation, approximately 60,000 Odessans (mostly Jews) were either massacred or deported. Many parts of Odessa were damaged during its fall and later recapture in April 1944, when the city was finally liberated by the Soviet Army. It was one of the first four Soviet cities to be awarded the title of "Hero City" in 1945. During the 1960s and 1970s the city grew tremendously. Nevertheless, the majority of Odessa's Jews emigrated to Israel, the United States and other Western countries between the 1970s and 1990s. Domestic migration of Odessan middle and upper classes to Moscow and Leningrad that offered even greater opportunities for career advancement, also occurred on a large scale. But the city grew rapidly by filling the void with new rural migrants elsewhere from Ukraine and industrial professionals invited from all over the Soviet Union. Despite being part of the Ukrainian Soviet Socialist Republic, the city preserved and somewhat reinforced its unique cosmopolitan mix of Russian/Ukrainian/Mediterranean culture and a predominantly Russophone environment with a uniquely accented dialect of Russian spoken in the city. The city's Russian, Ukrainian, Greek, Armenian, Moldovan, Bulgarian, and Jewish communities have influenced different aspects of Odessa life. In 1991, after the collapse of Communism, the city became part of newly independent Ukraine. Today Odessa is a city of more than 1 million people. The city's industries include shipbuilding, oil refining, chemicals, metalworking and food processing. Odessa is also a Ukrainian naval base and home to a fishing fleet. It is also known for its huge outdoor market, the Seventh-Kilometer Market, the biggest market of the kind in Europe. Odessa is situated ( 46°28'N, 30°44'E) on terraced hills overlooking a small harbor, approximately 31 km (19 mi.) north of the estuary of the Dniester river and some 443 km (275 mi) south of the Ukrainian capital Kiev. The city has a mild and dry climate with average temperatures in January of -2 °C (29 °F), and July of 22 °C (73 °F). It averages only 350 mm (14 in) of precipitation annually. The primary language spoken is Russian, with Ukrainian being less common despite its being an official language in Ukraine. The city is a mix of many nationalities and ethnic groups, including Ukrainians, Russians, Greeks, Jews, Moldovans, Bulgarians, Armenians, Georgians, Germans, Koreans, and many others. The Tolstoy, Vorontsov, Brzozowski and Potocki chevalry families owned palaces in Odessa, which can still be visited as architectural monuments. At present time, a 300 metre tall television tower with an observation deck is under construction. 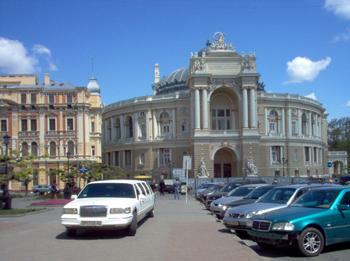 Odessa is a popular tourist destination, with many therapeutic resorts in and around the city. The Filatov Institute of Eye Diseases & Tissue Therapy in Odessa is one of the world's leading ophthalmology clinics. The Odessa Main Railway Station.In 1891 the first car in Russia came to Odessa: "Benz" brought from France belonged V. Navrotsky. He was the popular city publisher of the newspaper «The Odessa leaf». Urban public transit in Odessa is currently represented by trams (streetcars), trolleybuses, buses and fixed-route taxis (marshrutkas). Odessa also has a cable car, cable-way, and recreational ferry service. Odessa Internation Airport is served by major airline carriers, including Aerosvit, Ukraine International, Austrian Airlines, El Al, and Turkey Airlines. These and other airlines provide flights to numerous locations in Europe and Asia. Passenger trains connect Odessa with Warsaw, Prague, Bratislava, Vienna, Berlin, Moscow, St.-Petersburg, the basic cities of Ukraine and many other cities of the former USSR. Intercity bus services are available from Odessa to many cities in Germany (Berlin, Hamburg and Munich), Greece (Saloniki and Athens), Bulgaria (Varna and Sofia) and several cities of Ukraine and Europe. 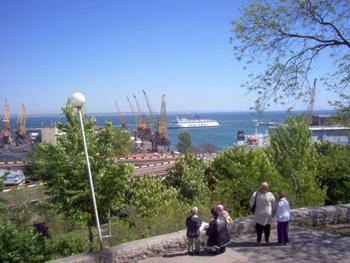 Passenger ships and ferries connect Odessa with Istanbul, Haifa, and Varna. Most of the city's 19th century houses were built of limestone mined nearby. Abandoned mines were later used and broadened by local smugglers. This created a gigantic complicated labyrinth of underground tunnels beneath Odessa, known as "catacombs". They are a now a great attraction for extreme tourists. Such tours, however, are not officially sanctioned and are dangerous because the layout of the catacombs has not been fully mapped and the tunnels themselves are unsafe. The tunnels are a primary reason why a subway system was never built in Odessa. Ze'ev Jabotinsky, a Zionist leader and author, was born in Odessa. Poet Anna Akhmatova was born in Bolshoy Fontan near Odessa. The city has produced many writers, including Isaac Babel, Ilf and Petrov, and Yuri Olesha. It has also produced several famous musicians, including the violinists Nathan Milstein, Mischa Elman and David Oistrakh, and the pianists Benno Moiseiwitsch, Sviatoslav Richter and Emil Gilels. The chess player Efim Geller was born in the city. The most popular Russian show-business people from Odessa are Yakov Smirnoff (comedian), Mikhail Zhvanetsky (legendary humorist writer, who began his career as port engineer) and Roman Kartsev (comedian). Zhvanetsky's and Kartsev's success in 1970s much contributed to Odessa's established status of a "capital of Soviet humour". Later several humour festivals were established in the city, including the celebration of the April Fool's Day.